I'm already looking ahead to detox after the holidays. This refreshing salad has great crunch and just the right touch of sweetness -- a welcome break from the hearty meals and sweets we indulge in this time of year. 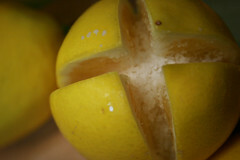 The original recipe calls for preserved lemons, but fresh lemons can be readily substituted. If you like this, though, I recommend starting a batch of preserved lemons for the future. They're fantastic in salads! 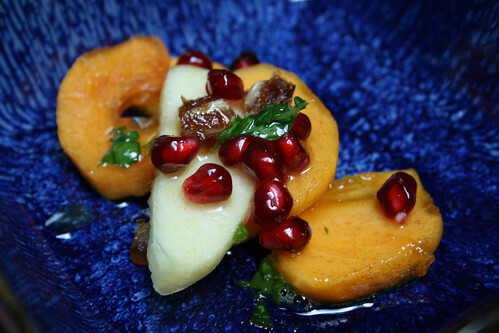 Be sure to use Fuyu persimmons, which are round and best enjoyed on the firm side. The heart-shaped hachiya persimmons need to be very ripe and soft, and won't work here. 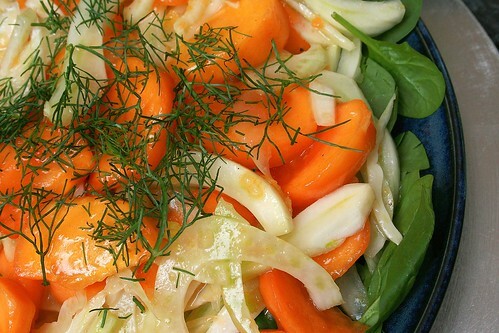 Fennel is also known as sweet anise. You'll need the bulb and fronds for the salad; save the leftover stalks to serve with dip, like celery. These might have too much sugar to qualify as a purely healthy contribution for The Kids Cook Monday campaign, but they sure beat all the other holiday sweets lying around. I first made these nuts a few years ago as a Christmas gift for my mother. They're now the only kind of seasoned nuts I make because, as the recipe's genius creator notes, they are the best spiced nuts. The kids can't stop eating them. I lost the original recipe, but when I saw it re-posted at The Hungry Tiger, I did a little dance and ran to share the news with my husband. The flavor is nuanced and addictive. The secret is the Thai hot sauce Sriracha and garam masala, a seductive Indian spice blend. (Think cumin, cinnamon, cardamom...) If you can't find it in a store near you, you can easily mix your own. There are lots of recipes for it, but this one relies on readily available spices you may have on hand. If you're looking for more of a project, there are countless recipes online for toasting your own seeds. 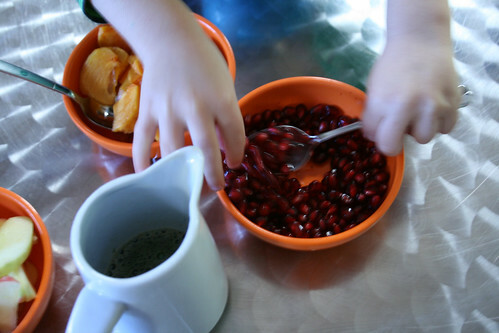 The two kids I recruited to help loved running the stand mixer and smelling the vibrant, colorful seasonings. 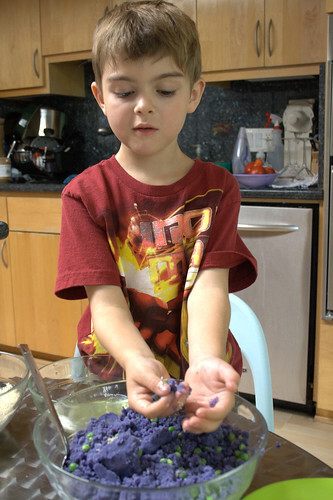 Kids can help with every step except sliding the nuts off the hot cookie sheets. This comes together quickly and makes a great holiday gift -- I'm bringing another jar home for the holiday. Here's the recipe, courtesy of The Hungry Tiger. I decrease the sugar by just a few teaspoons because I can't help trying to de-sugar the kids. This makes about 6 cups. Preheat the oven to 325 degrees. Line two cookie sheets with parchment paper (don't skip this; this mixture can make a mess of a baking pan). Beat the egg whites until they're foamy but don't hold a peak. Add everything else except the nuts, and mix together. Now start piling in the nuts, and stir to coat them well. Kids who like getting messy might enjoy using their clean hands to do this part. Spread the nuts on the parchment-lined baking pan in a single layer. If you have leftover coating in the bowl, toss in more nuts to coat and add them to the pan. 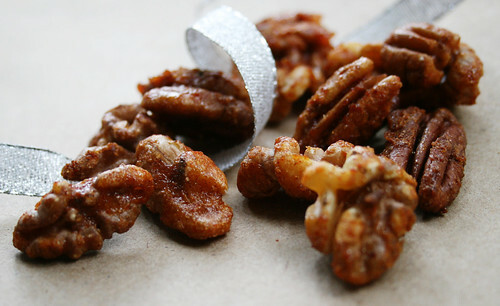 Bake the nuts for about 30 to 40 minutes — start checking them at 25 minutes or so. When you take them out of the oven, slide the parchment and nuts right onto the counter or a rack. Wait a few minutes so that they aren't painfully hot and steal a little nibble. Leave the rest alone until they cool completely, then break them up into pieces. Store in an airtight container so they stay crisp. I left some sitting out a little too long and they got gooey; 20 minutes in a 200 degree oven crisped them up again. 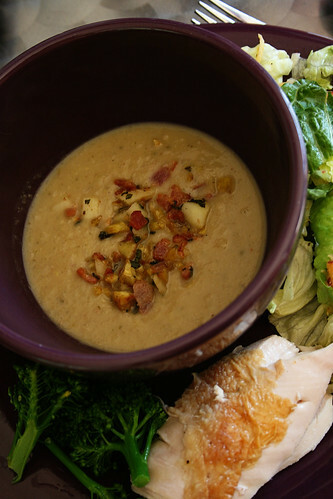 This is a surprisingly delicate, complex soup, sweet and savory, with nice texture. It can easily be the star of a holiday meal. How much work it is depends on the chestnuts: Vacuum-packed chestnuts from a jar are a perfectly acceptable shortcut, one I recommend. Fresh chestnuts are lovely, but peeling them is quite a project. You can peel them ahead of time and freeze them until it's time to make the soup. This is a lot of work if done all at once. If you don’t buy peeled chestnuts, I heartily recommend peeling them in advance and freezing them until you need them. The diced bacon also can be cooked ahead of time, to save on-the-spot prep. Serve with a simple, straightforward main dish, such as roast chicken. If using fresh chestnuts, bring a saucepan of water to a boil. Carefully cut the chestnuts in half with a sharp knife and put them in the freezer for 10 minutes. Add the chestnuts to the boiling water; boil for 8 minutes, then drain. Squeeze each half to pop out the meat, along with the dark brown pellicle surrounding it. This is much easier to do while the chestnuts are hot; you might want to do this in batches. If using dried chestnuts, bring a large pot of water to a boil. Add the chestnuts and simmer 10 minutes, then remove from heat and let soak for an hour. 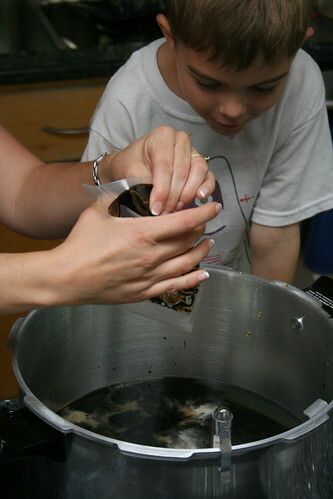 Vacuum-packed chestnuts can be used straight from the jar. Cook the onion, celery and 1/4 cup coarsely chopped sage in a large saucepan over medium heat, stirring frequently, until onion and celery are soft, about 5 minutes. Stir in all but 1/2 cup of the chestnuts along with the broth, cider, thyme, and bay leaves. Cover and simmer over very low heat for 45 minutes. Remove and discard the thyme and bay leaves; stir in vanilla. Puree the soup in batches in a blender (be careful not to overfill) until very smooth. Pour back into saucepan, stir in cream and sherry, and reheat to simmering. Add salt and pepper as needed. Irresistible, crunchy, smokey, and with some cheese melted in its core. This is an easy and delicious way to have a break from the holiday staples, yet a classic way to enjoy chicken at its best. It's a kid-friendly dish and it might be a chance for introducing other flavors to a good-looking plate. 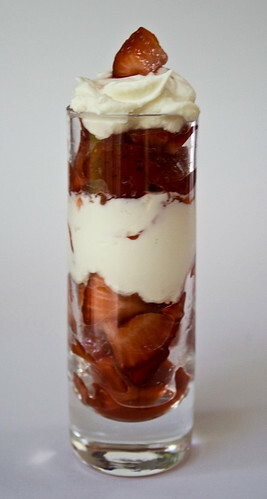 I will prepare it again this week - and probably will add a nice seasonal touch to it. It might be some cranberry goat cheese to substitute for the dried tomatoes and Swiss cheese. Either way, just the thought of it makes me feel like preparing and enjoying it soon. I used julienned sun-dried Roma tomatoes conserve and fresh shallots for the main personalities of this stuffing. After butterflying each chicken breast, sprinkle both sides with salt and pepper and cover both sides with plastic food wrap. Pound each side with the flat part of a pounder until the chicken is about 1/4 inch thick. Remove plastic from one side. Cover chicken with one slice of Gruyere cheese and one of smoked turkey. Spread mix of sun-dried tomatoes and shallots over turkey. Firmly roll the chicken breast with the help of the remaining wrapping plastic. Tuck in the edges and keep it held together tightly with the plastic. Repeat for each breast. Refrigerate rolls for at least 1 hour. Preheat oven to 400 F. Beat egg with water. Remove plastic wrap from chicken, and coat rolls with the egg mix, a layer of flour, and then panko (or regular breadcrumbs). Roast for about 30 minutes on the middle rack of oven. Make sure the core is cooked, and slice the rolls. Enjoy with your favorite veggie as a side. This is the point in the holiday season when I cull my list of good intentions and, for the sake of sanity, toss aside any plans that would cause more stress than joy. Cutting out and decorating sugar cookies didn't make the final list. Practicality demanded quick, easy sweets, like peppermint bark. If you've only had peppermint bark out of a box, you might be embarrassed to find out you paid way too much. 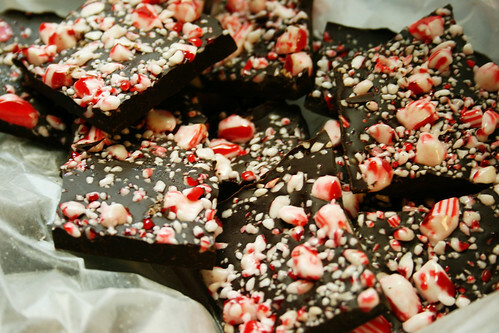 You need only two ingredients: peppermint candy and chocolate. I'm starting you off here with the simplest preparation, and then layering on the fancy for those of you who aim high. 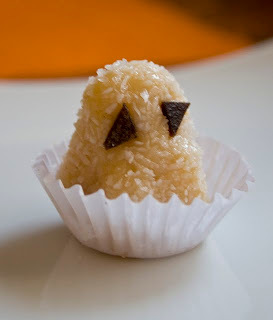 This simple, addictive treat is fun to make with kids and is a great gift for neighbors or lunch box treat. A few tips: To crush the candies, pulse them in a food processor or put them in a heavy, sealed plastic bag on the counter, cover with a towel, and crush with a mallet or rolling pin. I usually sift out the resulting powder and stir it into the melted chocolate. Freezing the candy canes for an hour makes it a little easier. The amounts given are just guidelines; adjust proportions to suit your taste. Finally, be sure to use baking chocolate rather than chips, which don't melt as smoothly. Cover a baking sheet with parchment or waxed paper. Melt the chocolate in a double boiler or the microwave (cook at 50% power for 1 minute at a time, stirring in between, until melted). Pour the chocolate onto the prepared baking pan, spreading it evenly. Sprinkle crushed candy on top and refrigerate until firm. Break up bark and keep refrigerated in an air-tight container. Glossy: Stir a teaspoon or so of vegetable oil into the chocolate for added shine. White Chocolate: Substitute white baking chocolate for the semisweet or dark chocolate. Extra Minty: Add a dash of peppermint extract to the melted chocolate. Two-Tone: Melt 8 ounces semisweet or dark chocolate and pour into baking pan; refrigerate 30 minutes. Prepare rest of recipe as described above, using white chocolate and pouring it on top of the now solid chocolate layer. I fondly remember the days when I regarded soda as a special treat. My favorites were birch beer, cream, and the crazy fruit flavors of Squeeze soda. I loved visiting the small Squeeze plant nearby and picking among the lollipop-colored sodas. My dad relished Moxie, which I found horribly bitter. But we did find common ground with root beer, which we occasionally brewed ourselves. My boys love "root berry," a rare treat reserved for the handful of baseball games we attend each summer. And Anna's boys savored a souvenir pack of Route 66 root beer from a vacation on the fabled highway. So we opened the Little Monsters Root Beer Brewing Co. for an afternoon to learn how soda is made -- kitchen science! The kids were thrilled, and intrigued by the element of danger: a large, bubbling cauldron, and a small chance of exploding bottles. 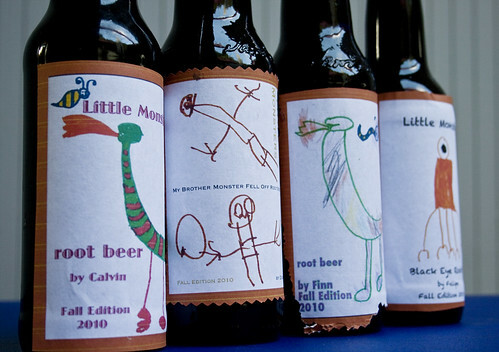 Anna turned scanned copies of the kids' drawings into custom labels. The kids cut them out while we prepared the ingredients. You can buy a modest brewing kit online for $15 to $30. In retrospect, I should have gone this route. I thought I'd do better at a local brewing supply shop. I hadn't done my research, and had no idea it was OK -- in fact, even preferable -- to make root beer in recycled plastic bottles. Instead, I spent more than I should have on things like a $15 gadget to secure metal caps onto our recycled glass bottles. 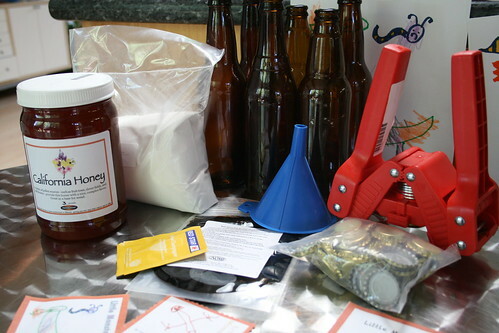 We used a Gnome soda recipe that called for yeast, honey, cane sugar, water, and root beer extract. It's easy to make: You need to use a thermometer to monitor the temperature of the mixture, but there's nothing tricky about the process. The kids took turns dumping ingredients into the giant canning pot, marveling at the amount of sugar. We talked about how yeast works, in foods like bread and in root beer. While mixing up the soda was easy, bottling and storing it was more problematic. Because of that yeast. Yeast basically eats sugar, creating the carbonation. Chilling the bottles gets the yeast to quiet down. If the carbonation process continues unchecked, pressure builds up and bottles can explode. So the bottles need to stay warm long enough for the yeast to do its thing, but not so long that the bottles burst. What I read and was told recommended letting the bottles to sit out for 24 to 48 hours. That seems a long window when you risk an explosion. Exploding bottles are no fun. As Anna could tell you. Which brings me back to plastic. If you use plastic bottles, there's no risk of shattered glass in your kitchen or refrigerator. And you'll know it's time to chill your soda and quiet down the yeast when the plastic bottle becomes firm. We chilled ours after 24 hours, and waited a few days to open the first bottle. The kids were giddy ... and then they picked up on the aftertaste. Strong, dark, a little medicinal. It didn't stop them from enjoying their custom soda, but they didn't gulp it down like they do at the ballpark. But they didn't mind at all: The soda was OK, but the grand experiment was "awesome!" Two months out, and I find the flavor in the few remaining bottles has mellowed some and is more enjoyable from start to finish. We might experiment with another brand of extract, a smaller batch, and plastic bottles in the future. A brand-new flour sifter and a ball whisk made the magic. They were so fancy that the kids asked to cook with me this Monday afternoon. Attracted by the new gadgets, the boys were pleased to know about what they were to prepare: Parmesan cheese pancakes. A nice and nutrition-loaded light dinner to celebrate one more post related to the campaign The Kids Cook Monday. 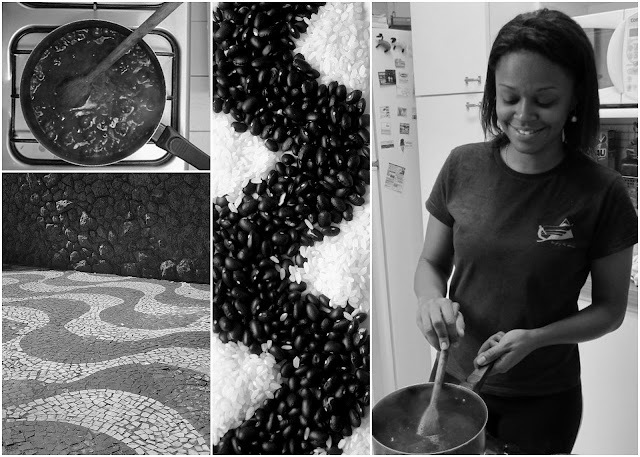 This very versatile variation of the Brazilian staple is a healthier interpretation: whole wheat flour, omega-3 eggs, and canola oil add more nutrition to the dish. The kids were happy to eat it plain with a generous dash of my favorite spread. But if you are willing, they can be rolled as traditional Italian manicotti and filled with spinach and ricotta cheese or even minced beef with veggies. Next time I will try to make them with spelt flour, adding some sunflower seeds to the dish -- I will let you know how that comes out. If you don't have wheat flour available, don't worry: any good all-purpose, unbleached flour will bring nice results. Sift flour and reserve in a bowl. Whisk egg, oil, and milk together in another bowl. Add sifted flour to the mix, whisking constantly. 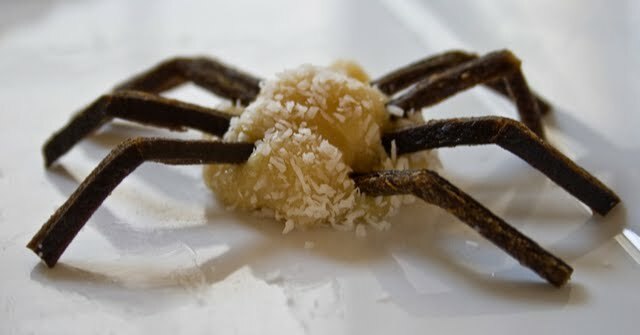 Whisk in cheese, salt, and nutmeg. Let the mix stand for 15 minutes. Heat skillet or griddle. Pour pancake mix onto the hot surface. With the help of a heatproof spatula, spread the pancake in the desired shape. When it starts to detach from the edges of the skillet or griddle, turn it over and cook until it is golden and looks ready to be devoured. Little I knew about the sisters Tatin when I chose to prepare this pie, inspired by the classic French dessert, with my leftover homemade cranberry sauce. So, after reading the many stories about it and learning some basics about its preparation, I waited for Darienne to arrive to talk about and prepare it. My plan was to invite the kids to cut the beautiful and soft ripe Williams pear and make the design of the pie on the bottom of the skillet. But I also had other plans for Darienne: a package of marshmallow and another of powdered sugar were over the counter with my hopes that she would teach me how to prepare marshmallow fondant. Of course, she did. And I think the result was so good that I will dare try preparing another batch by myself soon. Anyway, back to the Tatin's pie -- made originally with apples, nothing else than apples: Its preparation is charming, the ingredients are elegant, and the result can be amazing if you have the courage to flip the pie at the right time. To prepare the top of a pie on the bottom of a oven-proof skillet is the beginning of the reverse process. The boys were too busy to come to the kitchen and help, so we let them play soccer in the backyard. After 30 minutes we were devouring the pie with our eyes. And we loved its taste and texture. One of my boys had a big slice for dessert and asked for more. I must admit that we moms loved it so much that even if the kids are not interested on trying it, the beautiful creation of the French sisters will be inspiration over and over again in our kitchens. I used frozen pie dough from Trader Joe's, thawed, but you can use your own recipe. Also, my cranberry sauce was made with apple juice, Concord grape kosher wine, and juniper berries. Darienne chose cardamom to be the seasoning for the pears. To make the cranberry sauce: Cook all ingredients over medium heat for about 15 minutes. Let cool before serving. To make pie: Thaw pie crust to use it at room temperature. Preheat oven to the temperature recommended by the package, or the one you use normally. Now, on the stove top, melt butter in a shallow, ovenproof skillet. Before it gets brown, add sugar. 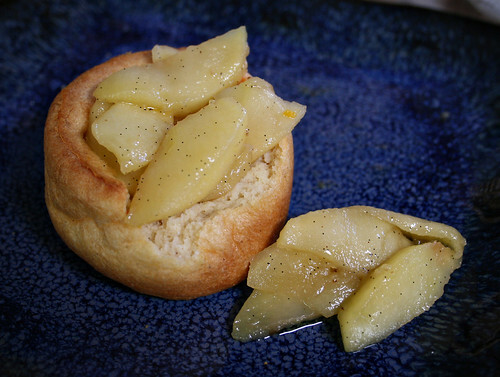 Arrange slices of pear in the skillet, over the melted butter and sugar, to cover the entire surface. Cook on medium heat until pear slices are almost translucent. Distribute cranberry sauce evenly over the pear slices. In the meantime, stretch pie dough to the circumference to fit the top of the skillet. When all is bubbling and smells good, lower the heat and cover the fruit with the pie dough, forming a lid for the skillet. With the help of a wooden spoon or spatula, push the dough down against the edges of the skillet. Remove skillet from stove top and put in the hot oven for about 12 minutes or until the crust is golden brown. Remove from the oven and let it cool down for few minutes. When the edges pull back from the edges of the skillet, cover with the skillet with a serving plate and flip it. Shake a little bit to help all fruit to come together to the plate. Good luck and bon appetit! 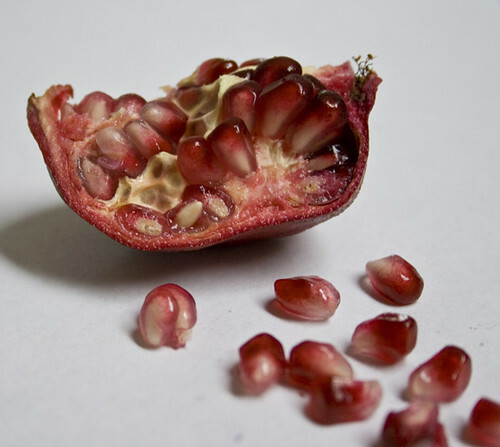 Some people chew the arils and spit out the seeds, but I don't. I like the crunch, and spitting out those tiny seeds takes a lot of the fun out of the experience. This fall salad came together at the farmer's market, where I find more affordable organic produce. 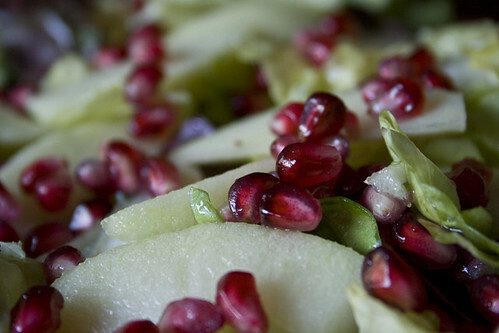 Organic apples at $2 a pound, a head of organic red butter lettuce, a beautiful deal on pomegranates (three for $1! ), tarragon from my garden -- and this salad was had for a song. The dressing worked a miracle in my house. 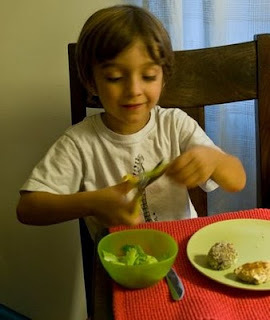 My older son, who has never eaten lettuce, happily ate three servings of greens. 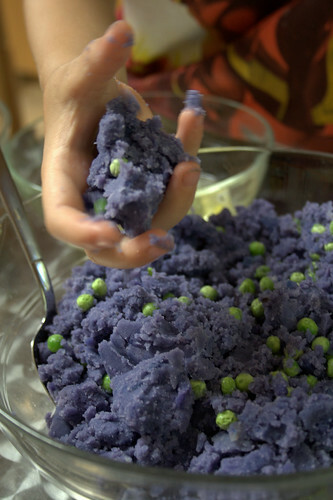 We used the dressing to season purple cauliflower for roasting the next day -- yum! Tip: If the high price of organic food puts you off, check out the Environmental Working Group's Shopper's Guide to Pesticides. Available as a pdf or iPhone app, it identifies the "cleanest" produce and the "dirty dozen" to help you choose when to go organic. Soaking the apple slices in acidulated water -- with lemon juice or vitamin C -- keeps them from browning. Leftover dressing will keep at least a week or two in the refrigerator. In a small bowl, stir together crushed vitamin C tablets or lemon juice with water. 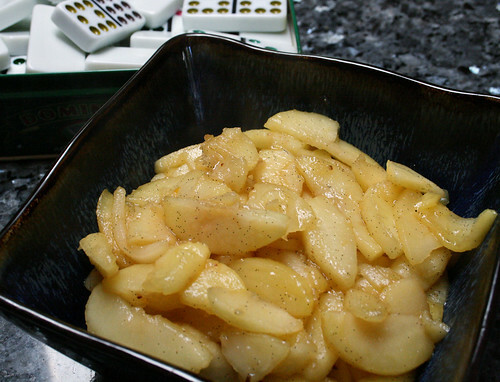 Peel, core, and slice apples, then immerse slices in water bath for a few minutes to reduce browning. Drain. Combine the dressing ingredients in a jar and shake to blend. Combine greens and apples in a large bowl; drizzle dressing over and toss to combine. 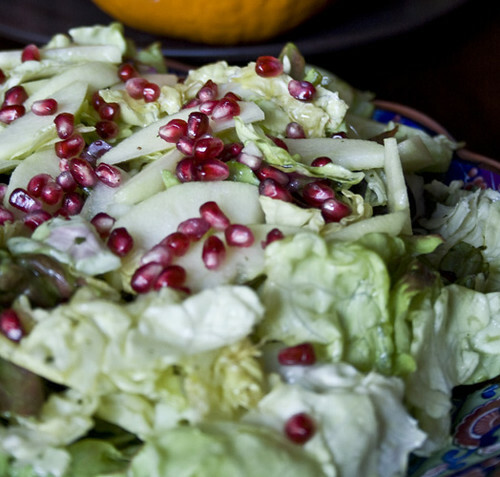 Top salad with pomegranate arils. My grandma always insisted that soup was the best thing on Earth. The way she found to convince me to eat all contents from that huge white porcelain bowl was to bring something delicious as a side: Sometimes it was just plain fresh roll from her favorite bakery to be covered with butter. Other times one of her creative appetizers was there, something like stuffed cheese and ham filled potatoes. So, for today's part of the campaign The Kids Cook Monday, here's one more way to enjoy the arrival of rainy days,and give hearty stews and soups a good company: a delicious savory muffin. The delicate dill touch enhances the smokey touch from the turkey ham. When the mix of cheeses melts inside, it create a unique texture to this impossible-to-stop-eating muffing. If inspired to have kids helping you, the opportunity is fantastic. They can help measuring and mixing and also chopping ham. 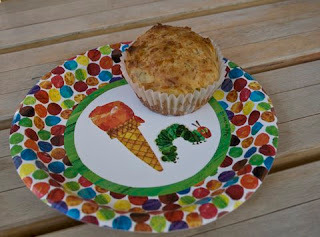 One popular activity with the 3 years old kids is to spray the muffin pan or cups with oil. Pre-heat oven to 400 F. Stir fry smoked ham in a hot skillet and set aside. Mix all dry ingredients in a bowl. In another bowl whisk egg with milk, yogurt and oil. Pour the wet mix into the dry bowl gradually. Add ham, and mix the batter slowly. Bake in a greased muffin pan (or muffin cups) for about 25 minutes. Yields 12 muffins. Thanks for all the well wishes on our anniversary! We hope you're enjoying the Halloween treats in Spook Play Explore, along with the scores of recipes we've shared here in the past year. The lucky winner of the Amazon gift card, according to the random number generator, is ... Alora! Congratulations, Alora -- we'll e-mail you to make arrangements. We had almost as much fun coming up with silly descriptions for these as we did making these fun nibbles for The Kids Cook Monday -- part of the Healthy Monday campaign. They're one of the creepy treats featured in our free e-booklet, Spook Play Explore. If you haven't snagged your copy, click here or the link to the right to get your free copy. And don't forget to enter our Amazon gift card giveaway before Wednesday! 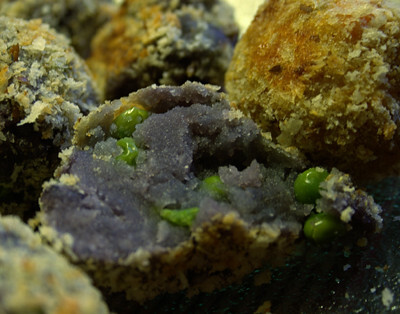 Nondescript on the outside, these treats break open to reveal vibrant purple and brilliant green. For an even more colorful presentation, pair these with a batch of Sweet Potato Nuggets. The boys measured all irresistible and delicious ingredients. They grated nuts and dried fruits, chose the granola mix, and blended it all. Finally they ate the final result in the same playdate! Weeks before they also designed the labels of their "Little Monsters" brand and could share the bars during a awesome camping trip with friends to Portola Redwoods Park. Hooray - one day those delicious home made bars will be my treat to kids at Halloween. But before I get to excited about this idea - and delirious-, about this possibility - let me share something else with you. 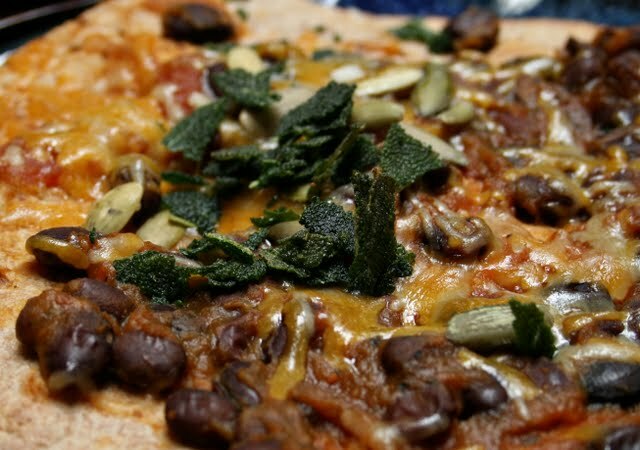 This is the first recipe to celebrate the beginning of our second year online. If you didn't have time yet to celebrate with us, don't forget to leave a comment at our anniversary post- you can be the lucky winner of a U$ 25 Amazon Card. 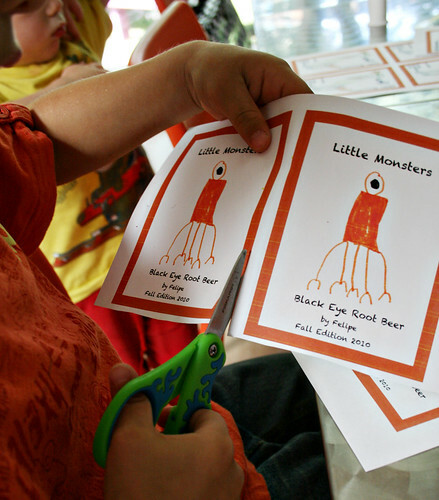 Also, as a "goodie-bag" we are sharing a free e-booklet Spook Play Explore on the upper right of the screen. You just download it and have a collection of healthy soups and yummylicious treats. Invite the kids to measure and mix the dry portion of the bars: crispy rice cereal, granola, mix of fruits and nuts, salt, cinnamon and coconut. 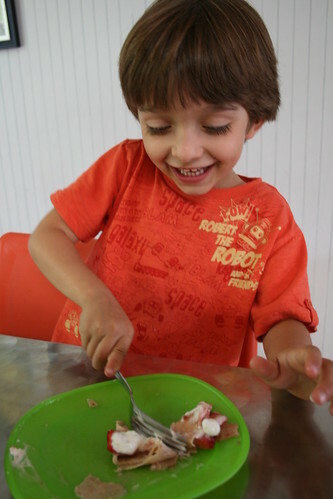 In our playdate, we used a Progress nut chopper to grind nuts and fruits, which was a great challenge for them. Brush a baking dish or cookie sheet with oil and line it with plastic wrap. Melt almond butter, honey and vanilla in a saucer over medium heat for long enough to have all ingredients mixed into a paste, stirring it all with the help of a wood spoon or whisker. Add the wet paste to the dried ingredients and stir. Spread the granola mix evenly with the help of a spatula, and cover it. Refrigerate for at least one hour or more to achieve the ideal texture. Once ready, the bars will look like the ones from the packages. Remove the plastic film and cut the bars into any length and shape you like. This recipe has a very specific inspiration: the Syrian-Lebanese sfihas served in Rio de Janeiro. Traditionally in their original source, they are made with ground lamb, but the popularity of those delicious morsels - as easy to prepare as to eat - was so big that after crossing oceans and generations they ended up being adapted and now have all different fillings. They may be stuffed with ground beef, green collards, and even some kind of ricotta cheese. 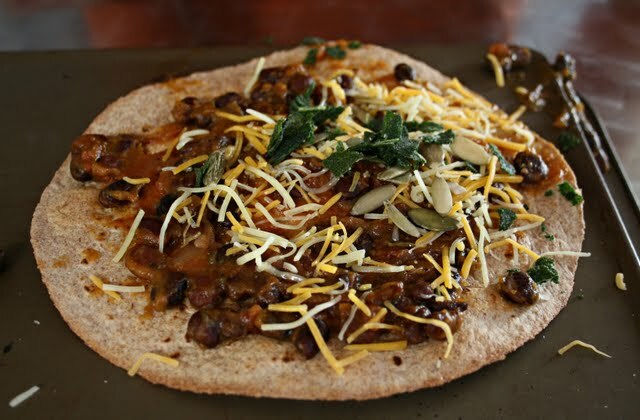 Sfihas might be also found with different types of dough and shapes. But the one I can't forget was a perfect triangle, and each bite of it made my mouth be full of water . That said, I can now indulge on something else. As a recipe that is beyond an adaptation. A free-short-cut and free-style interpretation of sfihas. 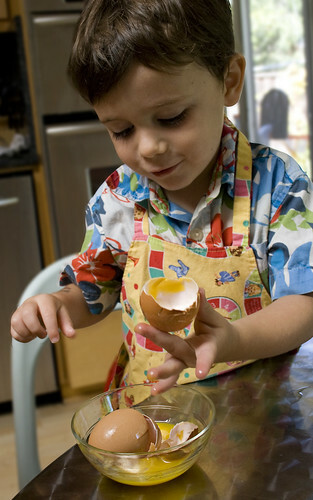 And a very easy one, so that I could invite the kids to cook with me. Kids helped to roll and cut the dough and even wrap their beef in diverse shapes. The result was delicious. And the now are asking me if this is going to be a regular Monday dinner! Those can be prepared ahead time and par-baked. I followed the instructions for my favorite whole wheat pizza dough sold at TJ - about 10 minutes at 450 F, and you can leave a bit less to end baking later or the next day. A possible vegetarian/vegan alternative for this recipe is to work with firm tofu instead of beef. Start up with the filling: Heat olive oil in a pot. With high heat on, add beef and fry it up to when it is almost totally cooked. Turn heat to medium, adding mushrooms and spinach. When all is cooked (mushrooms still al dente) get rid of the liquid collected on the bottom of the pot. Add allspice. Simmer for about 15 minutes, stirring to get all juices in the mix. In the meantime, turn the oven to 450 F. Sprinkle a baking sheet with some whole wheat flour or corn flour and spray a thin layer of olive oil over it. Roll the dough and cut all shapes that kids (or you) like. Transfer the dough pieces to the baking sheet. With the help on one spoon, put beef filling over pieces of dough, and close the parcels as you like. You mary roll, wrap the contents on a rectangle or triangle shape or just in a pocket style. You can invite kids to both of those parts of the process. Spray olive oil and sprinkle za'atar or sesame seeds on the top of each morsel. Add some couple more minutes to the time recommended by the dough package or your recipe if you are using home made dough. Garnish with a stream of olive oil around the pocket and some more spices if you love them. Enjoy while it is still hot. For today's The Kids Cook Monday post -- part of the Healthy Monday campaign -- I've got one of our favorite vegetables: sweet potatoes. They're full of flavor and, as Anna wrote last week, packed with beta carotene (and fiber!). We love them roasted with other root vegetables, or sliced up as oven-baked fries. Another fun way to eat them is in the form of croquettes. A fancy term like that makes my kids suspicious, so we call them potato nuggets. My boys wouldn't touch mashed potatoes -- but a crispy breaded coating makes all the difference. 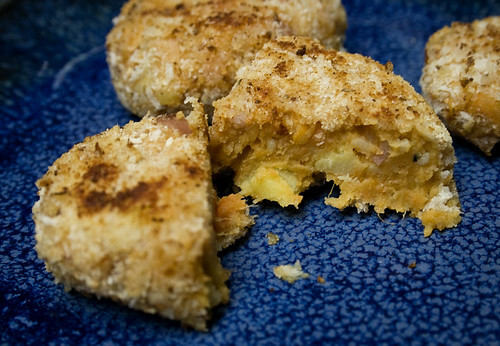 You can mix in almost anything your kids might like (a great way to use up leftovers) then bake or pan-fry them. They freeze well, too, making them a great homemade "fast food" for busy days. Kids who don't mind getting their hands dirty will have fun making these. My 3-year-old picked chicken-and-apple sausage as his mix-in, and handled everything from cracking eggs to squishing nuggets into shape and coating them with bread crumbs. This is a very basic recipe you can adapt to suit your taste. 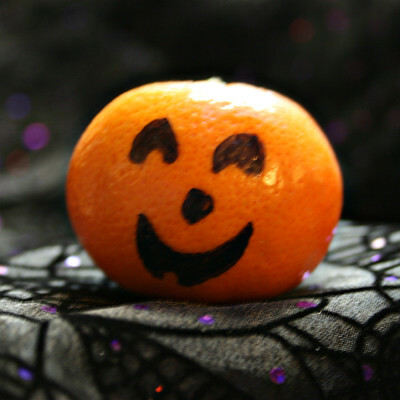 Choose deep orange sweet potatoes for maximum nutrition -- and fun. Combine sweet potatoes, butter, salt and pepper, and any spices in a large bowl and mash with a fork or masher. Stir in any extras, such as chopped meat or herbs. Refrigerate until well chilled. To form nuggets, scoop up a tablespoon or so of the potato mixture and shape into a nugget or ball. Dip into egg white and then into bread crumbs. Note: To cook sweet potatoes, wash them well and prick them with a fork. Rub with oil and bake in a 400 degree oven for 30 to 60 minutes or until soft. Or set on a white paper towel in the microwave and cook on high 12 to 18 minutes for four potatoes. Or cut peeled potatoes in 1 1/2-inch chunks and cook in a pressure cooker for 5 minutes. The New York Times just reported on an interesting study by the Centers for Disease Control and Prevention that found Americans aren't eating their vegetables. A quarter of us don't eat veggies three times a day, and all together we're eating half the vegetables health experts recommend. I certainly struggle: I expect my kids to eat their veggies, even to crave veggies, but I certainly don't model that kind of enthusiasm. The problems the NYT article points out -- particularly the time needed to prep fresh vegetables -- resonate in my home. The kids don't mind vegetables; it's the grownups who tend to dismiss them. My family has been trying to put vegetables more front and center in our lives and on our plates. We converted a good amount of our tiny yard into a garden, and the edible plants -- which grow with little attention from me beyond watering -- are now spilling over into our front yard. I take one of my boys to the farmer's market each week, and the kids help choose the week's produce. We have more meatless meals. But when we're pressed for time, vegetables are the first thing to get cut from our meals. And they're an afterthought at snack time. I'm acutely aware that I'm lucky to be able to offer as many good vegetables as I do, and that it still isn't enough. I have enough land and time to grow a modest garden, learning as I fumble through the seasons. I have time to go the farmer's market, and a child who makes the outing easy to manage. The veggies at the market are fresher, taste better, and are cheaper than what I find at the grocery store. I love that food stamps can be used at the farmer's market, but there's still the challenge of finding time for a market visit, getting there, and prepping all that fresh stuff. The idea of vegetables as "high art," as the Times article puts it, spells big trouble. Snobbery when it comes to vegetables is ridiculous -- and yet I worry I'm adding to the problem when I write here about an unusual vegetable that might be unavailable at a big-box grocery store, or hard to find outside my small corner of the world. 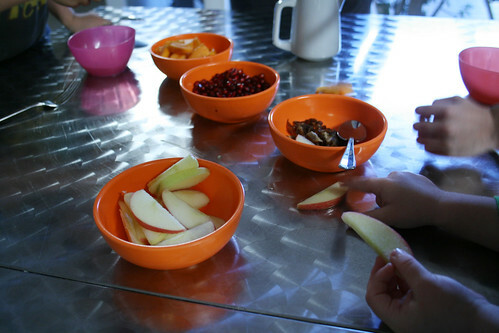 I was happy to see results of another study looking at Alice Waters' Edible Schoolyard program: "Students who gardened ate one and half servings more of fruits and vegetables a day than those who weren’t in the program." You might have seen early this year the Atlantic Monthly's overwrought essay excoriating the program as a detraction from the education of our kids. A schoolyard garden isn't going to solve all the woes of our educational system, but I find it impossible to argue with teaching children how to grow, prepare, and enjoy their own food. You can of course tie in math, botany, reading, and more, but frankly I'm happy enough to see kids learn a bit of self-sufficiency and indulge their curiosity. 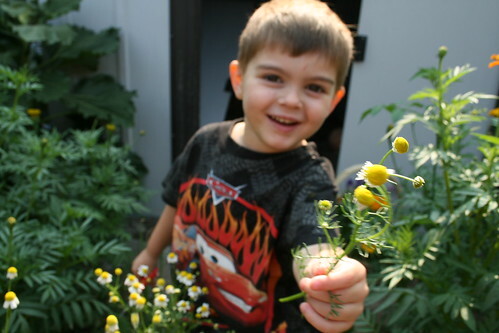 We're a month into the school year, and the most excited I've seen my first-grader has been when he's telling me about the bean-growing experiment his class is conducting, and his visits to the school garden. 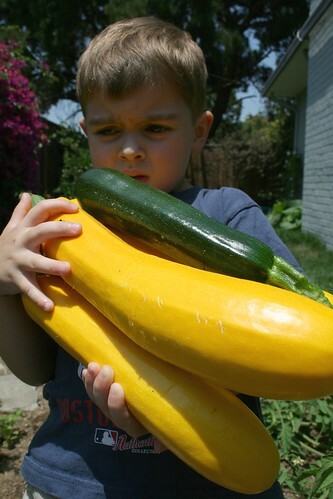 While I can't get him to help in our home garden, at school he was thrilled to nibble on raw zucchini, sample midget cantaloupe and yellow watermelon, and plant seeds for the winter growing season. He learned that while he doesn't care much for the big, thick broccoli stalks common at stores, the slender home-grown broccoli is pretty tasty. I agree -- so I've tucked some broccoli seeds in our small garden. Does your family eat enough vegetables?